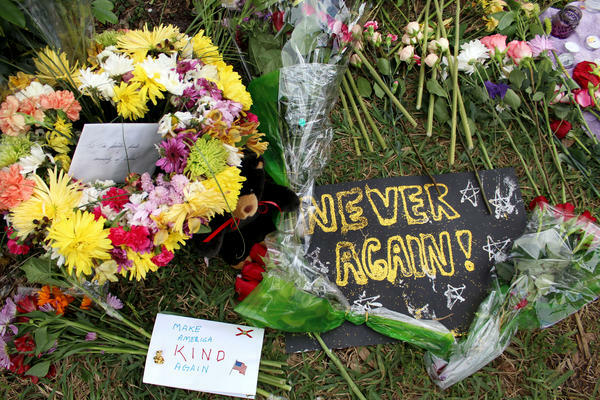 Students will be encouraged to participate in a community service project on the first anniversary of the shooting that claimed 17 lives at Marjory Stoneman Douglas High School. Any students who miss school on the anniversary or the next day, Feb. 15, will have their absences excused, according to an e-mail Principal Ty Thompson sent to families on Wednesday. "This day will be a Day of Service and Love in honor of our 17 Fallen Eagles," Thompson wrote in the e-mail. "We are encouraging parents to be involved with their child on Feb 14. Whether that is attending an organized service project together off campus, planning your own project that is special to your family, or simply spending some time together that day." Stoneman Douglas is following in the tradition of Columbine High School in Littleton, Colo., which has closed every year for a day of service on the anniversary of the April 20, 1999, shooting there that left 13 people dead. Senior Sawyer Garrity said she's relieved she and her peers won't be expected to have a normal school day. "Around [the anniversary] and leading up to it, it's going to get harder and harder," Garrity said. Garrity helped start Shine M.S.D., a foundation that aims to help the community heal through the arts. She said the anniversary is a reminder of why she has worked to create the nonprofit, and why other students have advocated for gun control and school safety since the tragedy: to honor the victims. At 6 p.m. on Feb. 14, there will be an interfaith vigil in Pine Trails Park in Parkland, the same location where a vigil was held the day after the shooting last year. Then, on Saturday, Feb. 16, late security guard and coach Chris Hixon will be honored with a memorial 5K run in Hollywood.